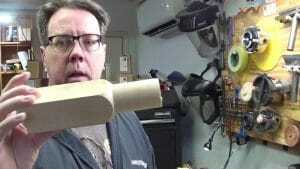 This project, although relatively simple, is vital to my woodturning career. Why you ask? Because it is on the “honey do” list. You know the list of things your wife or partner asks you to do. The result of letting this list get to long is a not healthy. I am of course joking about the health risks but there are consequences to not supporting your partner. I have been happily married for 25 years and my wife has been very supportive of my hobby for many years. Now that my hobby is morphing into a real business, I cannot lose sight of the fact that she is still supporting me, literally. So I have always tried to ensure there is headway made on the ‘honey-do” list. 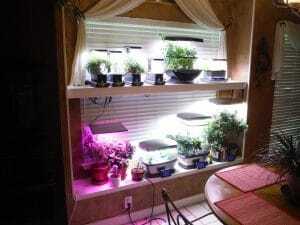 My wife has been a little obsessed with hydroponic gardening. I know the first thing you may think about but it is not that. 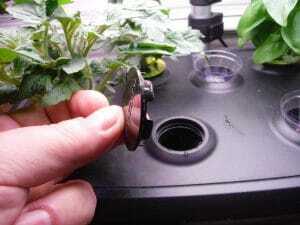 A couple of Christmas’s ago she got two small Aerogardens which are LED based hydroponic gardens systems. My wife now has nine systems and grows tomatoes, chives, arugula, basil, thyme, tarragon, rosemary, jalapenos, and probably something else I am forgetting. These are great systems and produce lots of edible veggies and herbs for us. 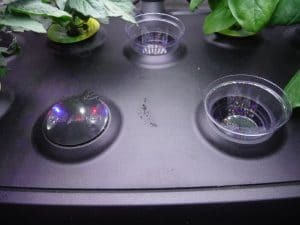 Since we live in Texas with unbearably hot summers these systems make it easy and comfortable for growing a small amount of plants. So for this project I am turning some pod covers. 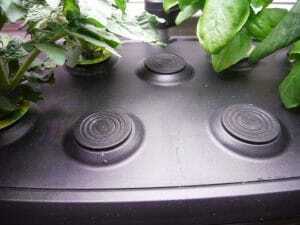 Each system has ports for each pod or plant. Not all ports get used so covers are needed on these pod openings so nothing falls in. My wife bought a few covers but has run out so she asked me if I could make some. “Of course, honey” I said … and here we are. This is a small project but should be easy to complete in an afternoon. The covers need to be shaped like a box lid – flat on top with a tenon on the underside. The top diameter is 1&1/2” and the bottom (tenon) diameter is 1&5/16”. The top thickness is about 1/16” and the bottom side (tenon) is about 3/16” for a total thickness of about 1/4”. I am using poplar for this project since it is inexpensive, light weight and it will be painted and finished so it’s a good choice for this project. 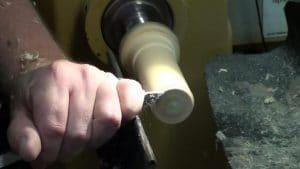 The blank I have chossen is a 2” in diameter 8” long spindle, however, I end up cutting it shorter to about 5”. You may ask why but then I would have to tell you that I made the first 3” too small of diameter – but no that didn’t happen, ehhem. To hold the work, I will be using the newly introduced Elio-DR. This is an improved version of the Elio Safe Drive that is Drawbar Ready. I have taken some time to do some research and prototyping for the process to convert the Elio drive to the Elio-DR by installing a ¼”-20tpi threaded insert into the end of the device. The use of the drawbar with the Elio-DR Safe Drive allows for safer operation as a faceplate without tailstock support. The drawbar is 1/4”-20 threaded rod covered with LLDPE tubing that has superb stress-crack resistance and remains flexible and durable in a temperature range between –103°F to 120°F, which means it will withstand any shop environment. The tubing is in place to protect the inside of the hollow lathe headstock spindle. 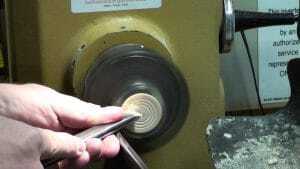 Both the rod and tubing can be cut to custom lengths for any lathe with a minimum of 1/2” diameter through bore. I have used 1.5” long #10 wood screws to attached the Elio-DR to the spindle blank. Screwing into end grain is not a typical way to use a faceplate but this is a small and light weight piece of wood that I feel comfortable using this method. 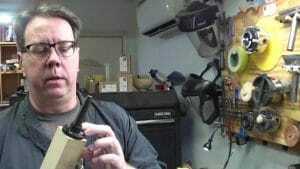 A note about woodturning safety: Be sure to follow all safety guidelines. You are responsible for your actions just as I am responsible for mine. Turn what and how you feel comfortable and safe. 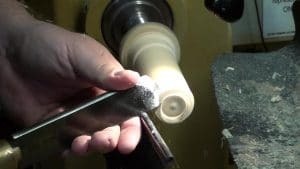 Once the spindle blank is screwed to the Elio-DR we mount is on the lathe. The Morse taper goes into the headstock spindle and the drawbar goes into the headstock from the handle (left) side through the spindle and is screwed into the Elio-DR blindly inside the headstock spindle. This is really quite easy to do as the plastic tubing helps position the threaded rod in a position to mate with the threads of the Elio-DR. The drawbar only needs to be tighten finger tight – no need to over tighten it. The drawbar, spindle and the Elio-DR drive will all spin at the same speed so there is little rotational torque to cause them to unscrew. Of course, as I do with all other work holding devices, I check that it is tight periodically while turning. Once mounted the methodology of how to create these pod covers is reviewed. First is to true up the spindle blank to a cylinder. 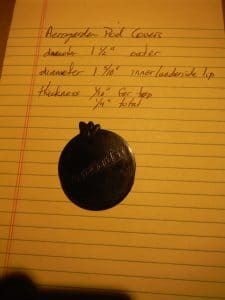 Then the diameter of the cylinder is reduced to the 1.5” as dictated by the required outer diameter of the pod covers. The following steps are followed for each pod cover. 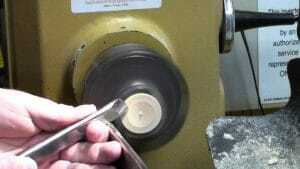 Using a beading/parting tool, cut the tenon to size of 1&5/16” in diameter by 3/16” wide. 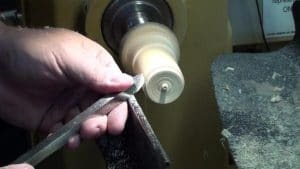 Use the beading/parting tool like a skew and shear cut the tenon to make a finish cut. 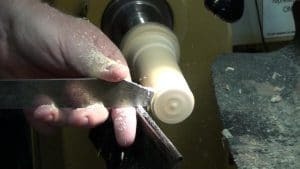 Repeat this step for a fine finish cut on the outer diameter of the lid. Still with the beading/parting tool, complete a shoulder cut to clean up the underside of the lid. 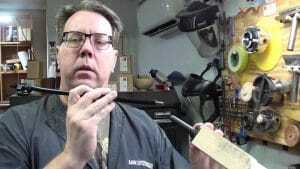 Using the skew, face of the end of the tenon. Use scraping action if needed to get a clean smooth surface. Using a thin (1/16”) parting tool, part of the pod cover (lid) leaving a 1/16” – 3/32” thick top part of the lid. Be sure to catch it or let it fall into a small box below the turning. Repeat the above for each pod cover. 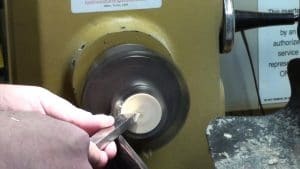 This process is pretty standard for any other small spindle project such as disk style jewelry, buttons, knobs, project inlays (such as pill boxes, keychains, and many others) and cabochons. I am using the skew in this project. I am getting more and more comfortable using the skew. 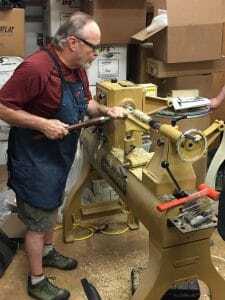 I recently took two days of skew turning classes from Alan Lacer. The classes where in late April 2017 and sponsored by the Dallas Area Woodturners. The first day was ‘beginner skew’ and the second day ‘advanced skew’. I will say that Alan is a good teacher and his approach is genuine and respectful and he knows how to use and teach the skew very well. My skew usage is much better this year compared to previous years. 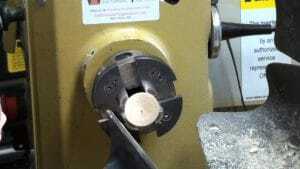 So I added the tailstock to stabilize the end of the spindle blank. My blank had a point center marking in the tailstock side so I used a tailstock live center with a cup end so that it would not register in the dimple previously left in the end of the blank. As I was using a planning cut with my skew I got a little carried away and ended up making the first 3” of the blank too small a diameter. So I parted of this three inches and that left about five inches left to us for the project. So it was a combination of skew practice and project work. No big deal. So here are the six steps in pictures. Remember that the spindle blank is screwed to the Elio-DR so be sure to account for the screw length in the headstock end of the blank. Mark with a pencil or a skew v-cut where the screws should be. This will remind you not to cut in this area. Once all the pod covers are parted off from the blank then it is time to reverse chuck them so that the top side can be cleaned up. 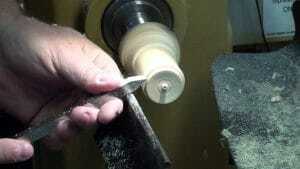 As you can see I am using pin jaws on my chuck and this leave the chuck jaws exposed to be a hazard to your knuckles. Be careful and use your judgement here. I did not have any problems having my knuckles in the way. However, I did get bit by these jaws during sanding. Nothing major just a little cut on the fingertip. Do it once and you won’t do it again. This just takes one or two passes with the skew doing a shoulder cut all the way across the face of the piece. I then used the skew like a negative rake scraper to smooth out the top. Perhaps with more skew practice I won’t have to so this but for now this is what I did. To dress up the top side I used the long point of the skew to create three concentric grooves. It was quick and easy and I think it makes the top side look a lot more interesting. From here it is just a bit of sanding on the top and them remove it and chuck up the next one and repeat the process. I completed all seven pod covers this way. I then painted each with black acrylic paint and then sprayed them with water based Polycrylic (Minwax product, I think). I choose the use water based finish products since these will be covering a hydroponic garden and they will be exposed to water. Mostly I didn’t want to contaminate the water with any other finish. I am no expert in the field of wood finishing so this is just a common sense guess. 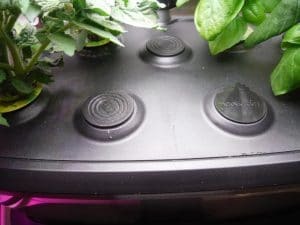 I hope they last a while but they are going to be exposed to a high humidity environment on the bottom and a hotter dryer environment on the top side. We’ll see. Here is a couple of photos of the pod covers in place. It is important to keep your wife, husband, partner and/or family involved in your hobby in some way. It keeps us connected to them and without their support us turners would be a scarce breed. “Happy wife happy life” as they say. I know my wife, Shelly, like these little pod covers. I have promised her a small foot stool – another project for the future.